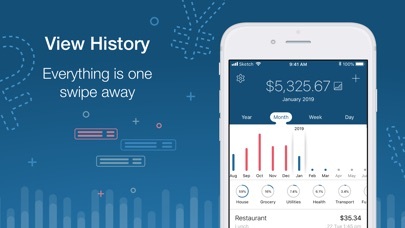 5coins is a simple, beautiful and smart app for tracking your daily expense. 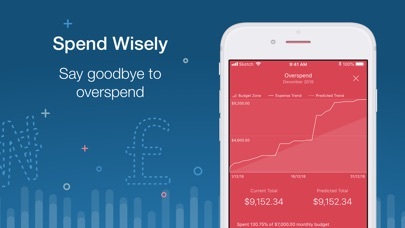 It lets you know how much you are spending, when and where your money goes. Spend 30 seconds daily, you will become master of your expenses! Highlights: 1. Super Easy User Interface No hassle to switch between different views. 5coins lets you do most things on a single user interface. Adding expense can be as easy as entering a number. 2. Budget View & Overspend Alert Just set your monthly budget. 5coins will let you know beforehand when you are spending too much. Just tap on the amount to view your current status. Support peek&pop, if your device supports 3D touch, 3. 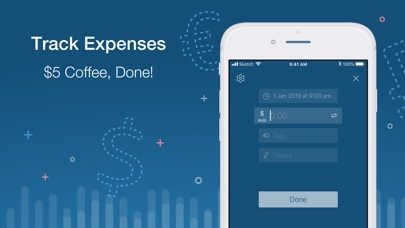 Regular Expenses 5coins remembers your regular expense and list them in today's widget as well as application shortcuts (iPhone with 3D touch only). So adding expense is just a few taps away. 4. iCloud Support Data is always available to all your iOS devices. Anytime, Anywhere. 5. Spotlight Search Support You can search expense in Spotlight without opening the app. 6. Privacy Protect your information with pin code and Touch ID or Face ID. 7. Multi Currencies World traveller? No problem, multi-currencies are built in. I love this app, it works really well and is super intuitive. It does just what it’s said to do very well and nothing more, another great quality. However, the new color scheme from the newest update put me off greatly and sadly makes me more hesitant to use the app. Could it be at least customisable, if not changed back? This app is truly great, clean, minimalistic, yet complete (for me). A few months ago there was a nasty bug in iOS 12 that prevented you from entering a decimal point, I don’t know whether that was Apples fault or not, but it’s fixed now, so I can rate full five stars again. I habe been using this app for 3 years now. It is very convenient and easy to use and helps me not to overspend my budget. I have some improvement ideas: - Monthly fix expenses have to be entered manually, could a simple planning tool enable automatic entries? - a search function to find/relocate passt expenses would be a plus. It’s a great and fantastic application, very well designed, simple, but with enough functions for tracking daily expenses. However, the developer seems to have abandoned this app, as there are a few very nasty bugs. First, the currency courses can’t be updated, but as one can change the values manually that isn’t a big problem. But with iOS 12, it’s not possible to put a decimal point when putting in expenses. That’s a really nasty bug, as it makes the tracking quite inaccurate. Apart from this bugs, it’s a great app, I hope they’ll get fixed! Ein wirklich nützliches Programm mit einer sehr angenehmen Benutzeroberfläche. Weiteres Plus: Ein von mir vorgeschlagenes Feature wurde innerhalb kurzer Zeit umgesetzt. Toller Service! Danke an den Entwickler für dieses wunderbare Stück Programmierkunst. Was nicht mehr geht, ist Einträge im Voraus einzugeben. Also, Ausgaben, die z.B. in der Zukunft anliegen, vorher schon einzugeben.